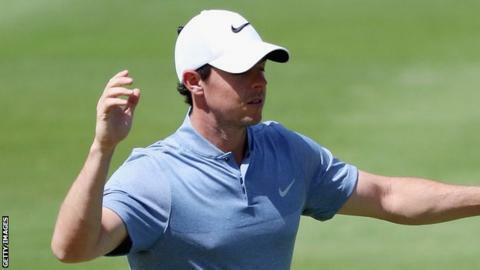 Defending champion Rory McIlroy needed a play-off before beating Kevin Na by one hole to reach the knockout stage of the WGC-Dell Match Play in Texas. McIlroy, 26, took the lead for the first time at the 15th only for American Na to draw level at the next. The pair could not be separated until Na, 32, found rough with his drive at the second extra hole and made bogey. World number two Jason Day progressed too after his opponent, Paul Casey of England, withdrew with stomach pains. Former Ryder Cup player Casey - who could not qualify from his group - won the first two holes of their match on Friday in Austin, and was two holes up until losing the fifth and sixth with bogeys, before withdrawing. The quick victory was a welcome one for the Australian, who struggled with back spasms during his opening match on Wednesday against Northern Ireland's Graeme McDowell. US PGA champion Day will now face American Brandt Snedeker while McIlroy will play reigning Open champion Zach Johnson, who saw off Shane Lowry of Ireland 4&3. Jordan Spieth eased past Justin Thomas to maintain his perfect record in the group and he will tackle former Open champion Louis Oosthuizen of South Africa. Matt Kuchar of America was never down against England's Justin Rose and claimed a 3&2 victory to win group seven and set up a match with his compatriot Brooks Koepka. Patrick Reed dismissed compatriot Phil Mickelson 5&4, having been seven up after 10 holes, and will now take on Dustin Johnson in arguably the tie of the round. Sergio Garcia bowed out despite beating Marc Leishman 5&4 - as a result of Ryan Moore's 3&1 triumph over Lee Westwood - but fellow Spaniard Rafa Cabrera Bello is through and faces Byeong-Hun An. Scotland's Russell Knox lost 5&4 to Branden Grace of South Africa but it was Chris Kirk who progressed from group 11 as the American beat David Lingmerth 3&2. Sixteen players progress to Saturday's knockout phase from the 64-strong field that was divided up into four-man groups for a round-robin format that began on Wednesday. The quarter-finals follow the last-16 ties on Saturday, with the semi-finals on Sunday followed by the Championship match.